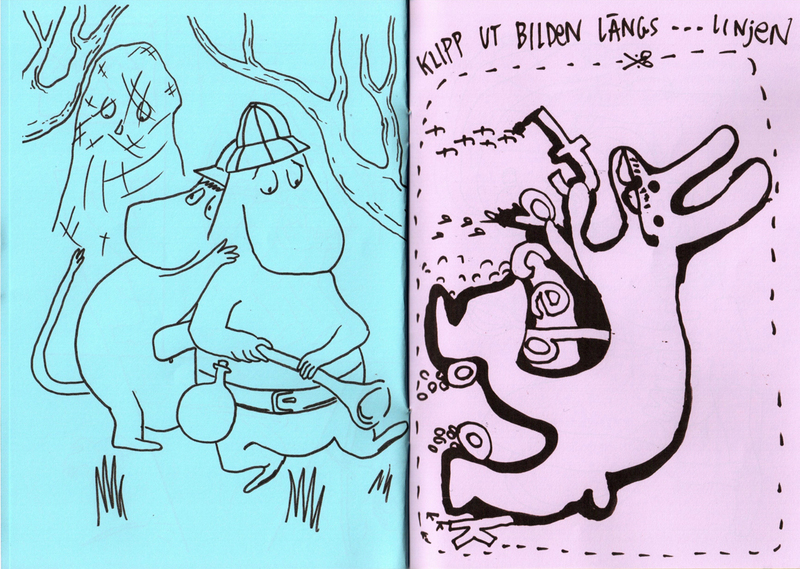 Finnish Comics Society organises a workshop for twelve 18–30-year-old Nordic comics artists in Helsinki, August 2018 to make publications with a risograph. The theme of the week-long workshop is to delve into modern Nordic folklore, myths and urban legends and tell these stories in short comics story format. The finished RISO publications will be distributed during Helsinki Comics Festival in September 2018. There are always stories that stay with you, especially the ones you have heard as a child. Some you have learned from your grandparents or from friends during a sleepover. You’ll be walking down a dark forest road and you’ll remember the one with the ghostly footsteps of a dead suitor following a maid in the middle of night. Or on a cold winter night you might recall the one about the snowmobile driver whose brains froze when he drove without a helmet. 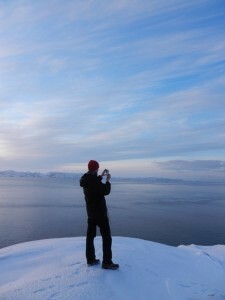 At the workshop, the participants will create short story comics focusing on contemporary and traditional Nordic sources. The stories can be based on persisting traditional stories, unsolved mysteries from the past, topical urban legends of the day or even the roots of sayings and proverbs we use everyday. 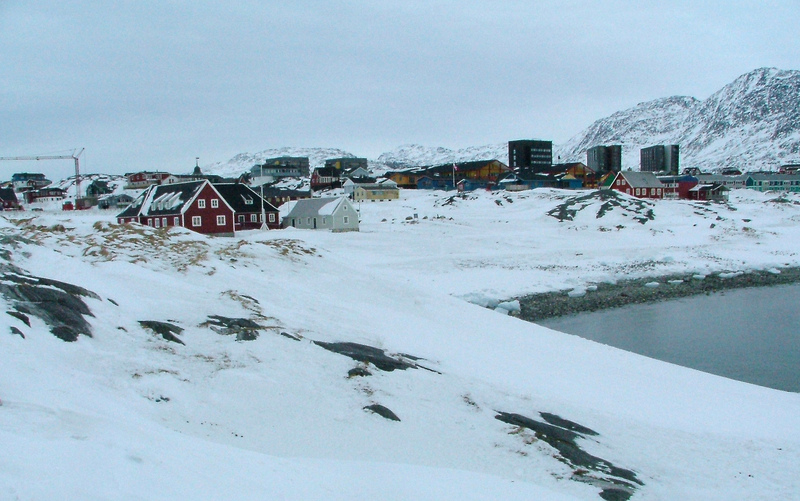 The North is full of sources from which to draw inspiration – where will you start from? We advice participants to avoid using source material from indigenous or minority e.g. Sami or Roma folklore, if you are not yourself of that heritage. We enthusiastically encourage artists of indigenous and minority backgrounds to apply for the workshop, so we can provide new platforms for your voices to be heard in the comics world. 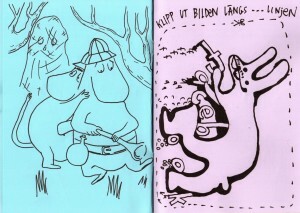 Finnish Comics Society invites 12 young Nordic comics artists to Helsinki to make publications with a risograph. The RISO printing machine gives the possibility to make almost offset-quality as easy as with a regular copy machine. The participants will plan their initial story ideas beforehand with the workshop leaders via online feedback, giving then more time to execute the final artworks during the workshop week. The participants will print the publications for the Helsinki Comics Festival 2018 weekend. 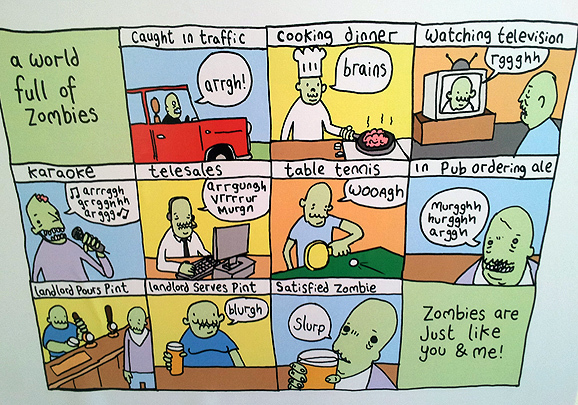 The working language of the project is English, but the created comics can be in any language. The project will include an online preparation period 1.6.–25.8.2018, during which the participants select and plan their stories ideas together with the workshop leaders and each other. The workshop will take place 26.–31.8.2018 in Helsinki. During the week, the participants finalize their story pages and create the printed works (zines and posters) with Comics Center’s RISO machine. 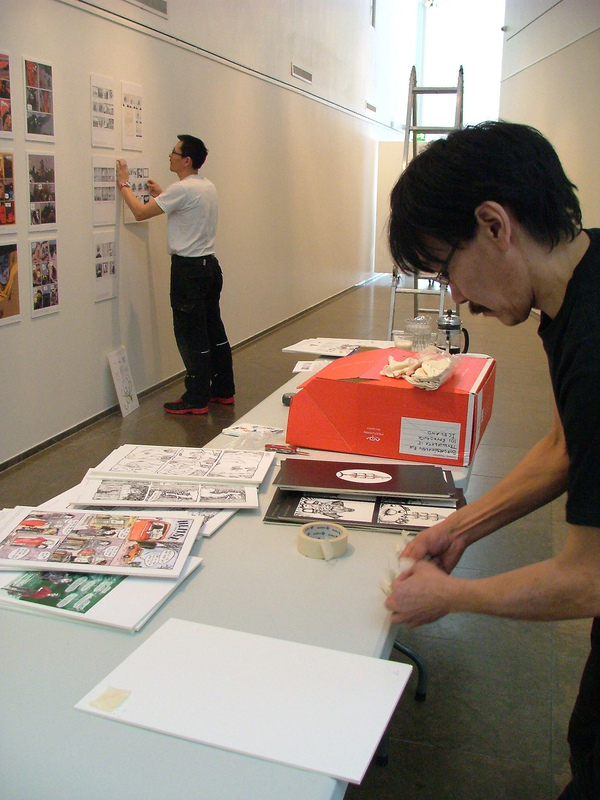 Participants keep rights to their original works and the print runs created at the workshop. Finnish Comics Society reserves only the right to use artwork created during the project to promote the project in a non-commercial capacity. 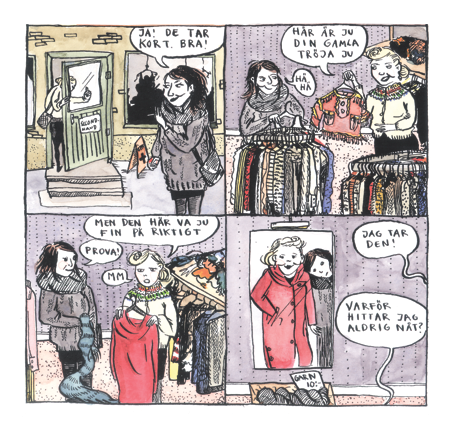 Finnish Comics Society will similarly keep a small portion of each print run for its archive and to showcase project results. 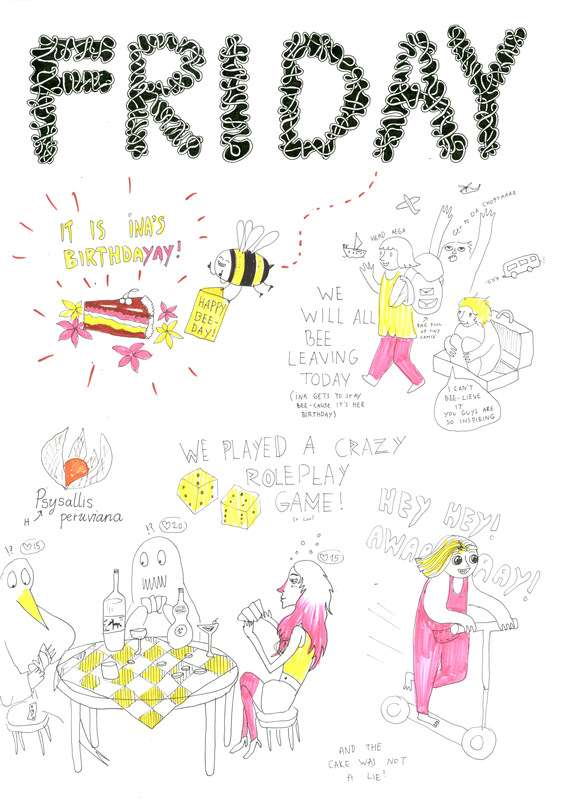 The created print runs will be distributed at Helsinki Comics Festival 1.–2.9.2018. The festival will provide a joint-exhibitor table at its Zine Fest sales area. 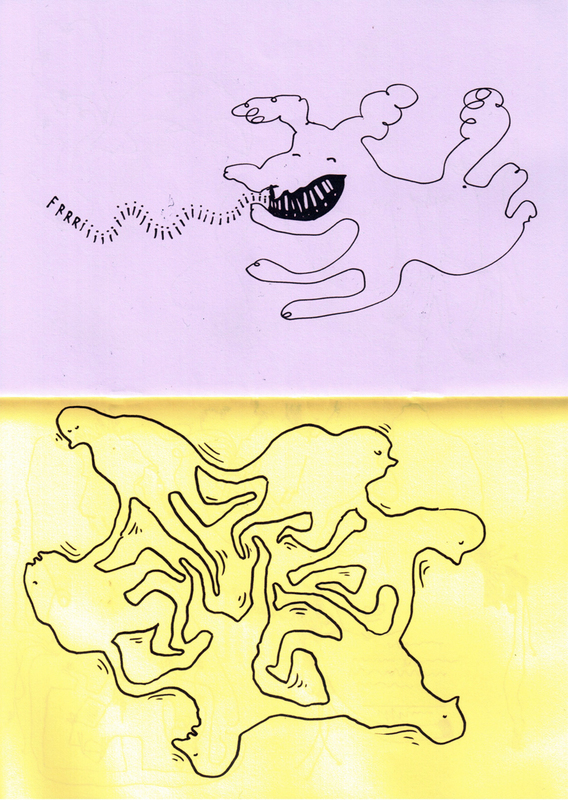 The created RISO print runs can either be distributed free of charge or at prices decided among the participants. Applicant is of Danish, Finnish, Icelandic, Norwegian or Swedish nationality or is living currently in Denmark, Finland, Iceland, Norway or Sweden. Applicant must be 18–30 years old. Fill in the following form by the application deadline 4th June 2018. In addition to your contact details, add links/attachment files to your comics portfolio/web comics and write about three (3) possible story ideas you would like to work on during the project. 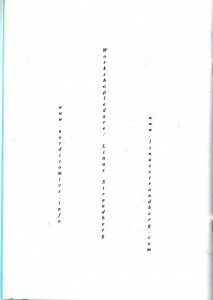 Present each idea in short 1–3 sentence paragraphs. There are 12 workshop places available in total, and 2–3 places for each eligible country (Denmark, Finland, Iceland, Norway, Sweden). The participants will be selected based on their existing body of work and the story ideas presented. 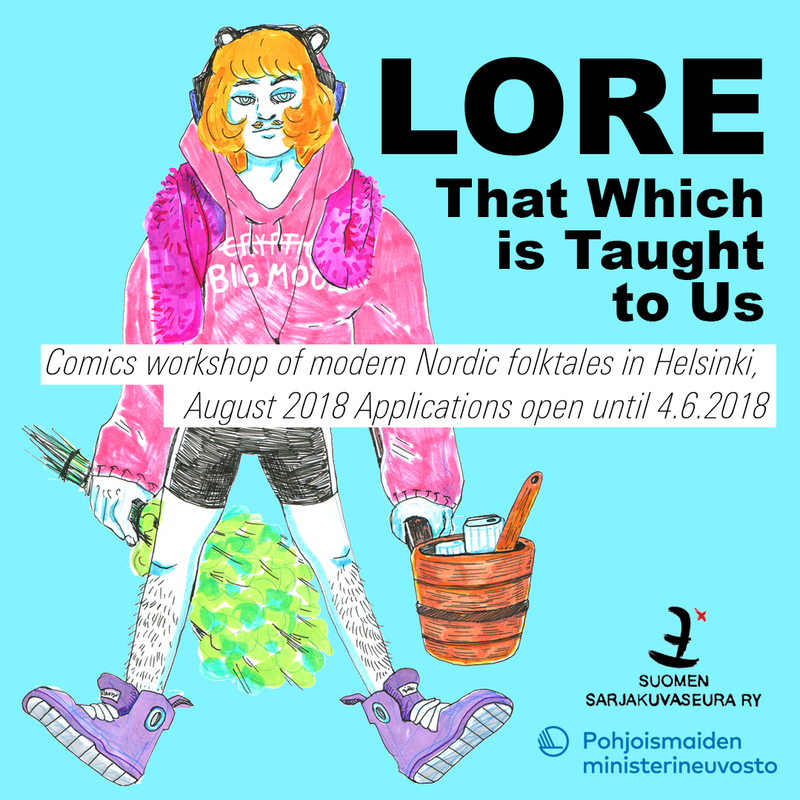 Finnish Comics Society strives to further inclusiveness, accessibility, equality, diversity, community and and anti-racism in all its functions, including the Lore project. In addition to project proposals and body of work, the Society will take into account equal and diverse representation of genders, backgrounds and other factors in the participant selections. 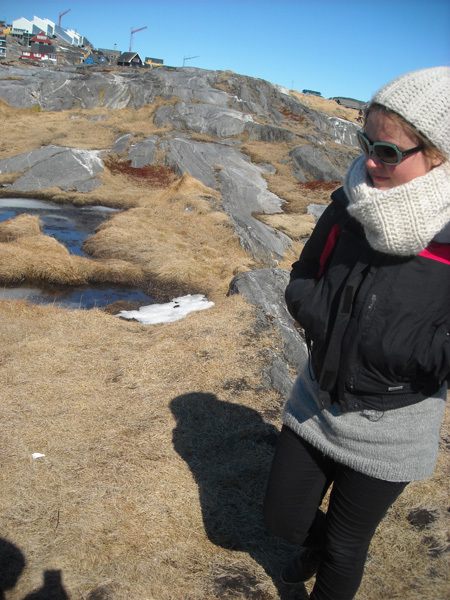 Lore – That Which Is Taught to Us is supported by NORDBUK (Nordic Committee for Children and Young People) in 2018. Nordicomics Youth! 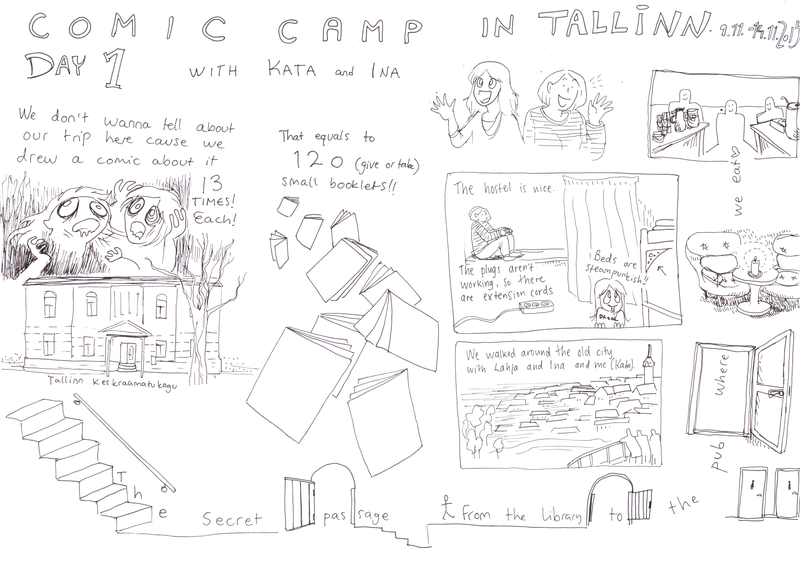 Comics Camp went to Tallinn in November 2015! This time the camps had participants from Finland, Estonia and Sweden. 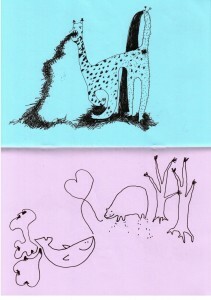 The main focus of the camp was on fast pace and making zines. 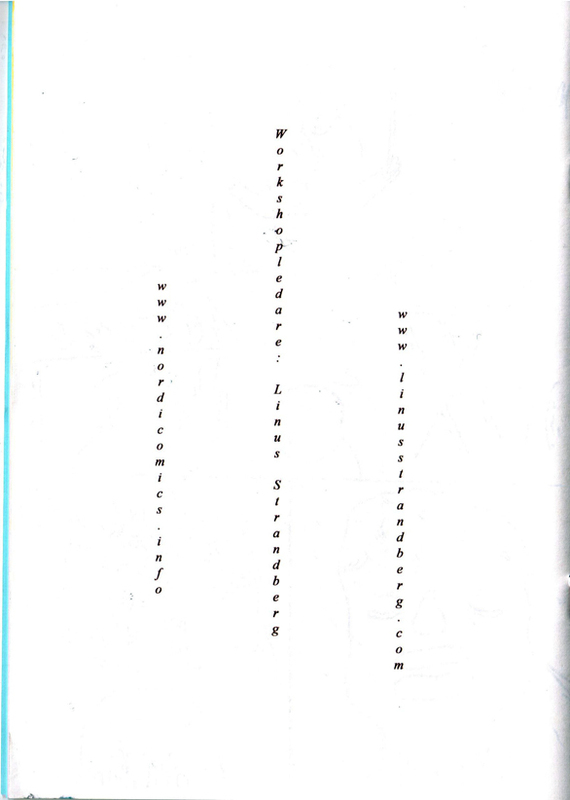 Lots of fast exercises, accompanied by feedback. 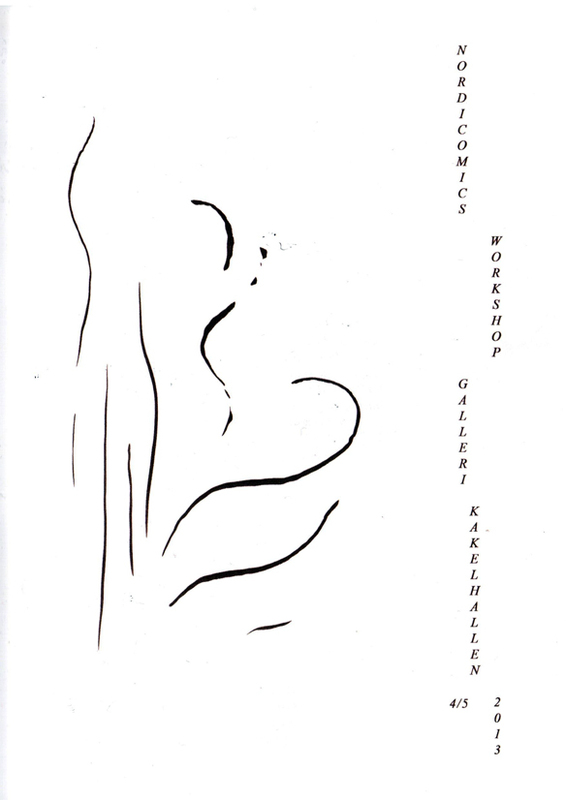 The amount of comics made in Tallinn was staggering. 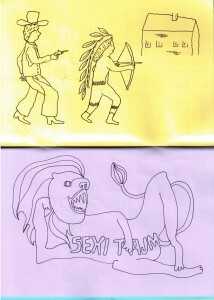 The participants dipped to the world of game play by using RPG elements to make a improvised comic zines. 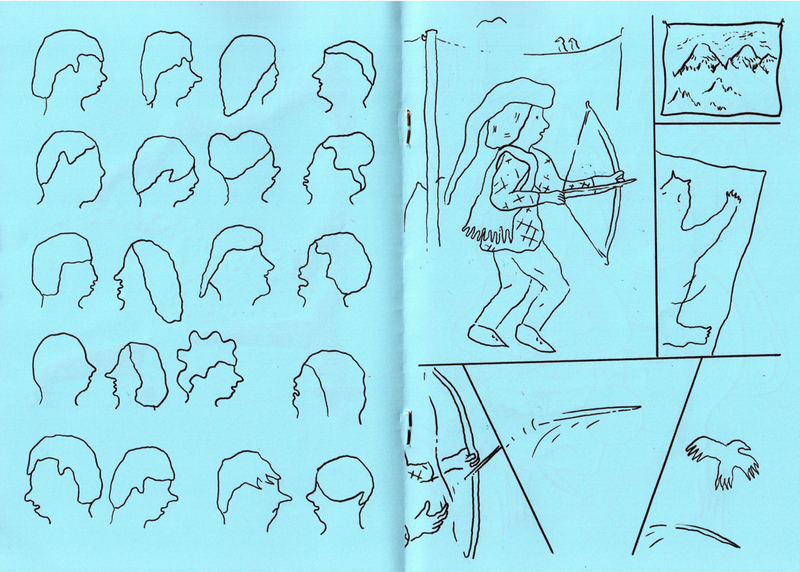 The camp also had tiny history lessons concerning the history Finnish and Estonian comics scene. What’s in store for the future? In January 2016 there will be an exhibition in Stockholm, Sweden where the works done in Helsinki and Tallinn camps will be present. 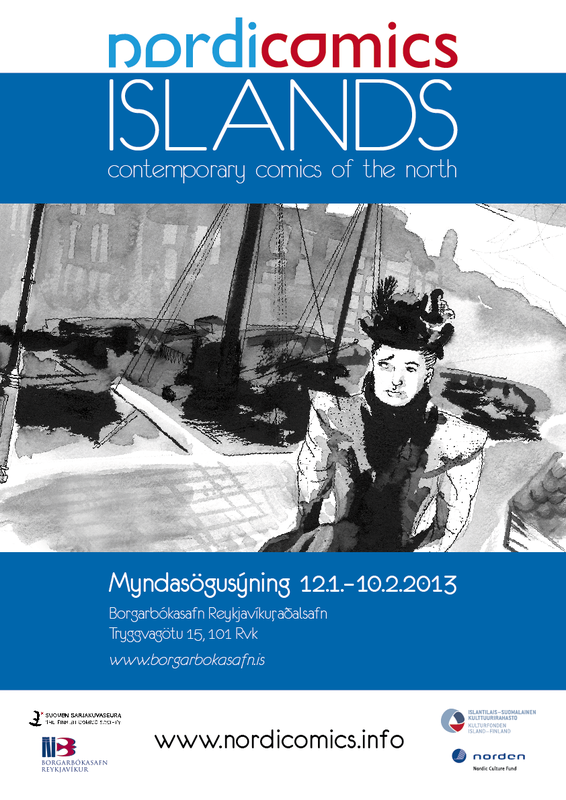 The Finnish Comics Society organised two Nordicomics Youth! comics camps in the later half of 2015 to help young comic artists, between ages 18 to 29, from Finland, Estonia and Sweden. 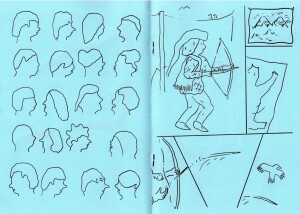 During both camps a lot of comics were produced, new revelations made and a lot learned. The participants got to plan and work on their own project in the Helsinki camp. The workshops in Helsinki & Tallinn supported each other by offering different content. 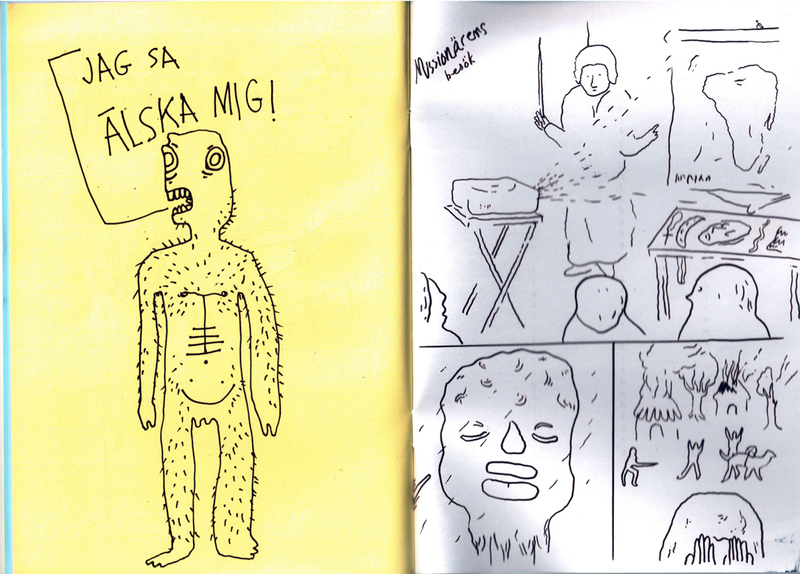 The comics camp in Tallinn focused more on exercises and making a lot of content in short amount of time eg. 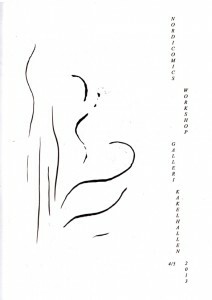 short one page comics, technique experiments and small zines. The camp was a great way for people to meet old acquaintances and make new friends as well as share information about a mutual passion; making comics. 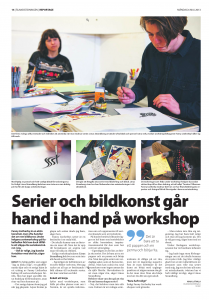 The workshops were taught by Finnish and Estonian comics professionals. Nordicomics Youth! exhibition will be held in January 2016 in Serieteket, Stockholm, Sweden. 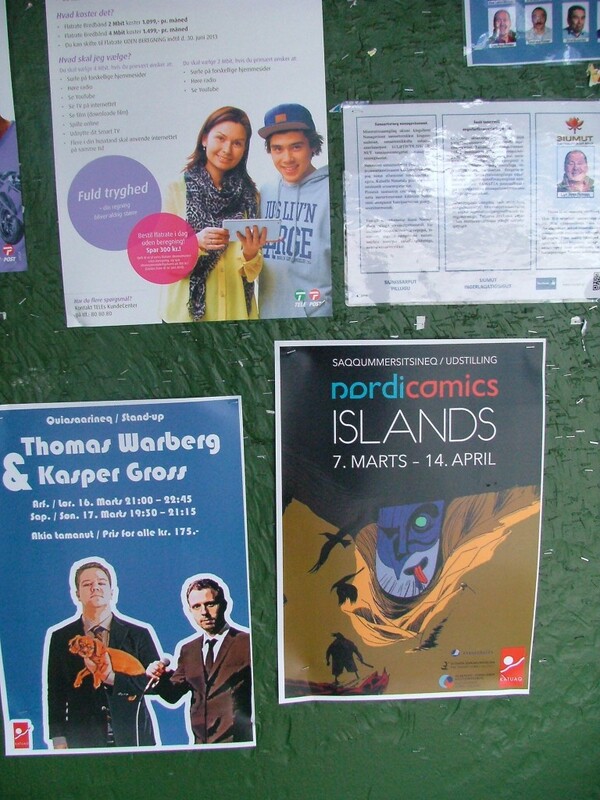 The Nordicomics Youth! 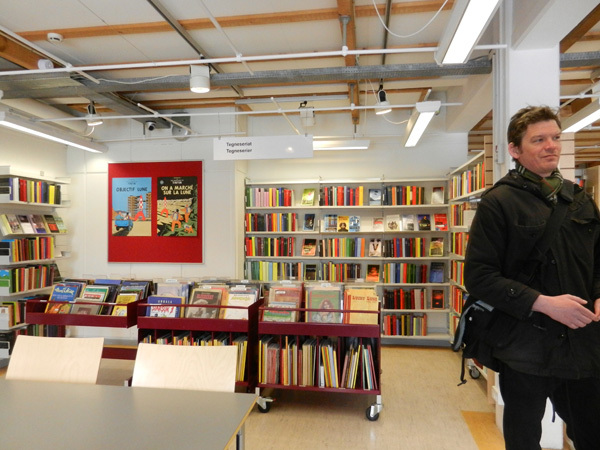 Comics Camps were organised by the Finnish Comics Society and received support from Finnish Ministry of Education and Culture and Svenska Kulturfonden. 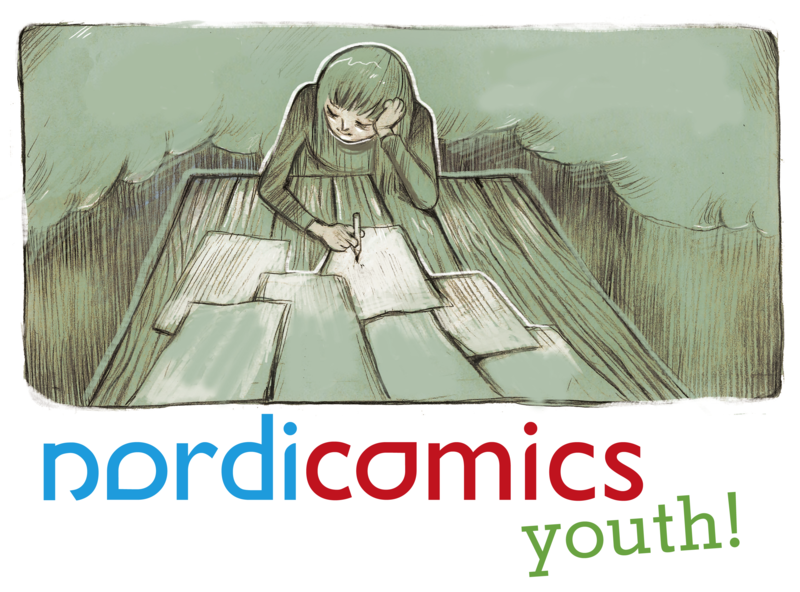 Finnish Comics Society organised the first Nordicomics Youth! comics camp for young artists in August 2014 at Luukki camp center, Espoo. Ten artists aged between 18–25 years from Norway, Finland, Sweden and Estonia took part in the camp. 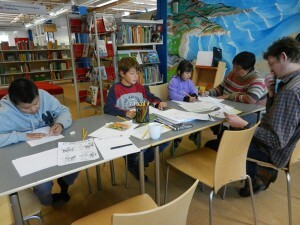 During their week-long stay the young artists worked on their own comics stories guided by Finnish professional artists. Gallery Sarjakuvakeskus is proud to present the finished stories and the working process of the camp now in an exhibition of its own. 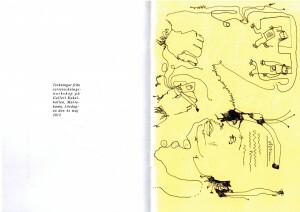 The exhibition presents works by Johanne Eikå Bergill, Ida Eva Neverdahl and Jofrid Sandgren Østenstad from Norway, Jennie Sörensen and Sara Hernoldson from Sweden, Ina Rosberg and Yrtti Taivaloja from Finland and Leore Klyszejko from Estonia. The Nordicomics Youth! camp was organised by the Finnish Comics Society and received support from Nordic Children’s and Youth Committee – NORDBUK. A bunch of comics-enthusiasts gathered on August 8th at the Comics Center to celebrate the opening of a new exhibition at the Comics Center Gallery. The atmosphere was literally quite warm as people circled inside exploring all kinds of monsters and robots doing their daily routines. The man behind the exhibition is Matt Boyce (1981), a British artist who comes from a bilingual family. Both his parents are deaf, and he is fluent in English and British sign language. 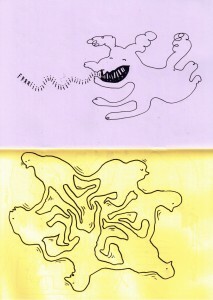 Sign language is part of both his own art and teaching work at a college in London. 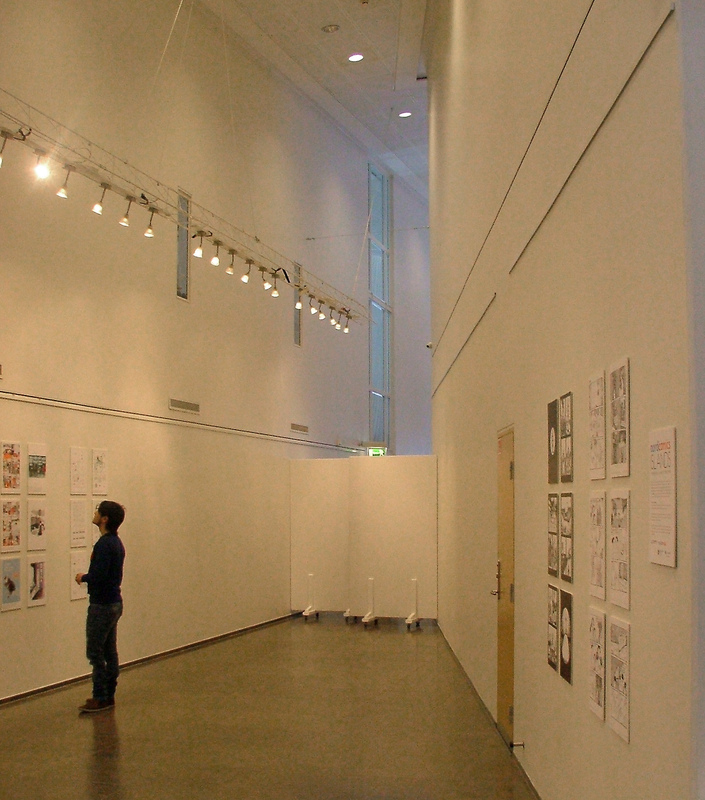 The Everyday Monsters exhibition is part of Matt’s residency project in the CUNE Comics-in-Residence programme. The day before the opening I sat down with Matt and we talked about the residency and his stay here in Helsinki. What are his plans for the forthcoming month, what are his first impressions so far and what are the things that inspire him? Matt told me that during his first week in Finland he has mainly done some touristy things like looking at sights and walking around Helsinki. 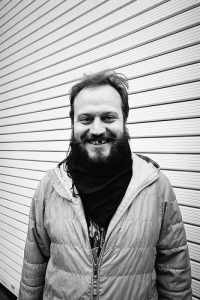 During his residency Matt will be staying at Suomenlinna, an island off the coast of Helsinki that holds an old maritime fort built in the 18th century. He has been overall impressed by his lodgings at HIAP residence center. “It’s great to have a big house all for myself. It’s the biggest place I’ve ever stayed in. It’s kind of funny to have a big space for painting and there I am, working on my comics.” During his residency Matt will be working on a new comic book, but that’s still very much a work in progress. 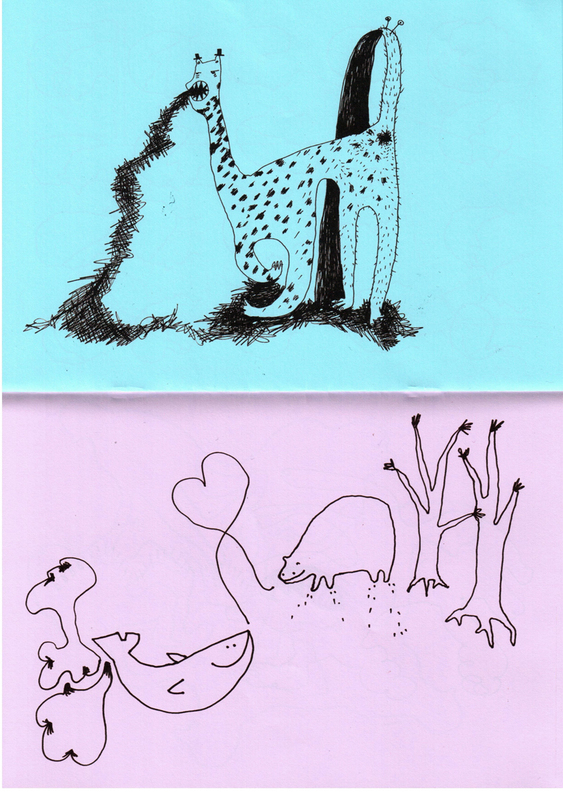 The most important thing for Matt is that everyone can draw comics and express themselves. This will also be the basis of the workshop he will be teaching during August at the Comics Center in Helsinki and HIAP’s Gallery Augusta. During the workshop the participants will be making autobiographical comics using sign language, similar to the courses Matt is teaching in London. 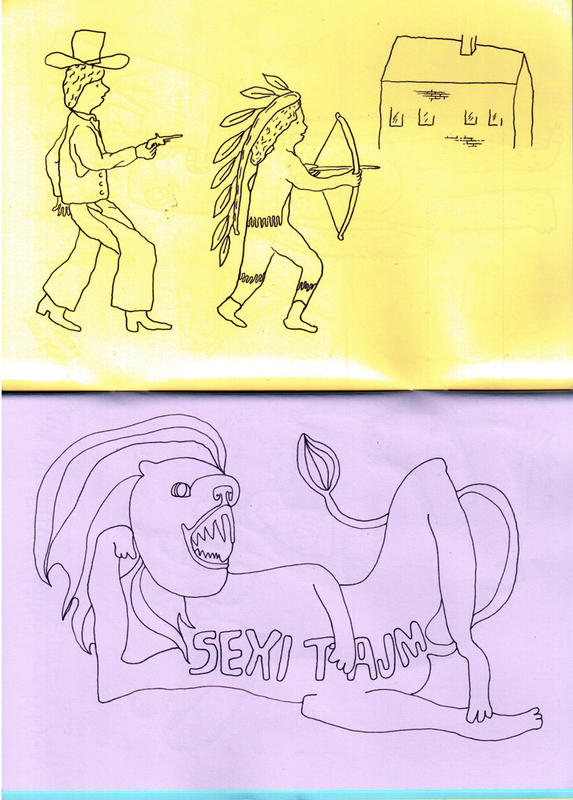 He showed me some comics made in the workshops by deaf children who are leaving school. In the comics they talk about themselves but also their fears regarding the future. Matt explained to me that in England, deaf children get support and help with studies while they’re at school but after graduation they might have anxieties about the future. In their comics the children talk about their dreams for the future but also the obstacles they might run into. Matt describes the island he is living on as both strangely silent and filled with tourists at the same time. The tourist crowds have actually given him an inspiration for a zombie-comic – both tourists and zombies are known to wander around in large packs with no sense of direction. 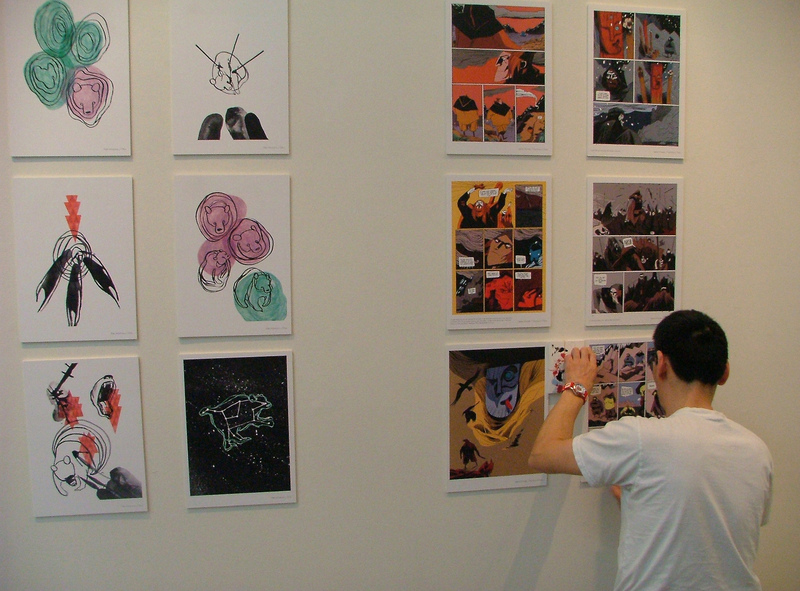 EVERYDAY MONSTERS exhibition is open at the Comics Center Gallery until August 31st. Interview and exhibition photos by Laura Antola. Matt’s photo by Jack Barnes.